Make a double move (e.g. between and back under), explode to a chair (or cone), make another double move (e.g. behind the back), pullback and square up, crossover, ball in the other hand, repeat with another chair. Stay low after the first move, don't stand up. - no double or triple moves. See Dribbling - Wojo guard box, Change of pace, Tony Watson series (drag pullbacks), also YouTube video - How to dribble jab-step (continuous stepback crossovers). A triangle of chairs (cones) is a tight gauntlet of defenders, make an initial move at the first cone then a counter when the defence cuts you off, make a move back in the opposite direction for a pull-up shot. 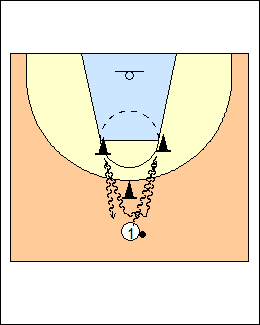 - make a pull-up shot behind the second cone, or a stepback shot. 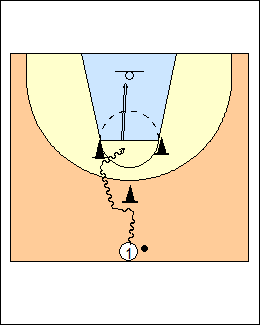 Billy Donovan - make a combo move at the first cone then one dribble outside a second cone to the rim. See Dribbling - 4 cones, Matt Doherty, Chair drill, Halfcourt drives, Coach Rock cones (point-guard series), Layups - Turn the corner, Shooting - 5star shots off the dribble, Crossover jumpers, Altizer 3-step explosion, 5star finishing.